We all want to find that certain someone, but it can be stressful nowadays to find ways to connect with new people or experiences to bond over. Enter: your dog. Finding and raising a fun loving, personable dog can be the perfect way to start a conversation with someone new or connect over shared experiences—like a ruined pair of shoes or an embarrassing puppy kindergarten story—while giving you a companion for life. Here are our top breeds of dogs to be your wingman or woman. Keep in mind, however, that all dogs will vary individually based on their unique personality, experience and upbringing, making it important to do as much research as you can about a specific breed before making the commitment to one. Additionally, as much fun as a dog can be as your sidekick, you’ll want to make sure you can devote the time and effort needed to owning a dog before taking them home. A gentle, easygoing breed that enjoys being around people and (if all goes well on your dates!) loves kids, the Bernese Mountain Dog is known for it’s strength, agility and intelligence. Used for drafting and droving work in the mountainous regions for which it is named, the Bernese Mountain Dog excels in therapy work, herding activities and agility training today. Self-confident, alert and good-natured, the Bernese Mountain Dog is never shy, American Kennel Club spokesperson Lisa Peterson said. Plus, its beautiful, plush coat just begs for a hug. 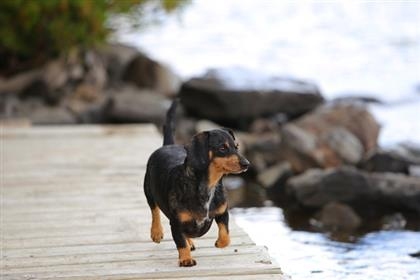 A lively, playful breed with three different coat types—smooth, wirehaired and longhaired—the Dachshund is one of the most popular breeds in America. With a long body, short legs and a keen sense of smell (to help you sniff out a good date, of course! ), Dachshunds are friendly and can adapt to a variety of living conditions, from the country to the city, because of their small size. A breed that adores people, Boxers love to be with their owners and have a strong desire for human affection, particularly from children. Bred and used as wartime couriers, boar baiters and seeing-eye dogs, Boxers are powerful and have strong guarding instincts. While they may be protective of their people when other dogs are around, they certainly wouldn’t mind the attention and affection from a prospective date. If you’re looking for someone to get fit with, the German Shorthaired Pointer makes the perfect wingman or wingwoman. An athletic, intelligent breed, the GSP was bred as a sporting dog and is used for trailing retrieving and pointing a variety of game including quail, raccoons and deer. A loyal watchdog for an active owner, the German Shorthaired Pointer has a strong build and even temperament. Because of their high-energy nature, expect to spend lots of time outdoors with your GSP and (hopefully!) bumping into all kinds of people in the park or at the beach. Originated in the 19th century France as a companion dog, the French Bulldog continues to be a popular lap-warmer and people pleaser. With a short nose, compact body and large, round-tipped ears, French Bulldogs can be seen in a variety of colors including brindle, fawn, white and brindle and white. An affectionate, sweet-tempered breed that tends to get attached to one person in particular, French Bulldogs are active and alert without being too rowdy—the perfect combination for a single person looking for a well-mannered but fun pal. A warning, however: the French Bulldog is not the ideal wingman for the beach. Because of their short noses, they can have difficulty breathing and tend to overheat in warm weather. Looking for a wholesome, all-American match? Look no further than the Golden Retriever, one of the most popular breeds according to AKC registration statistics, to be your sidekick. An intelligent, hardworking and loving companion, Golden Retrievers are patient, friendly and generally do well with children. Skilled in hunting, search and rescue, therapy and seeing eye work, you can even train and volunteer your Golden to do some therapy work, opening your horizons to an entirely new group of people. Easy-going, friendly and trustworthy, the Cavalier King Charles Spaniel makes an adaptable and happy companion. Easy to train and thrives as a part of the family, this tiny pup will be at home in the city or in the country and will readily visit with new people, making it a great match for a person on the shy side, Peterson said. There’s one thing pet parents can always agree on: discussing what breeds make up their one-of-a-kind mutt, making a mixed breed dog the perfect conversation starter for single pet parents everywhere. And, if you’re looking to earn some do-gooder brownie points while socializing, consider volunteering at the shelter or organization where your beloved mix breed was adopted from—you never know who you’ll meet.